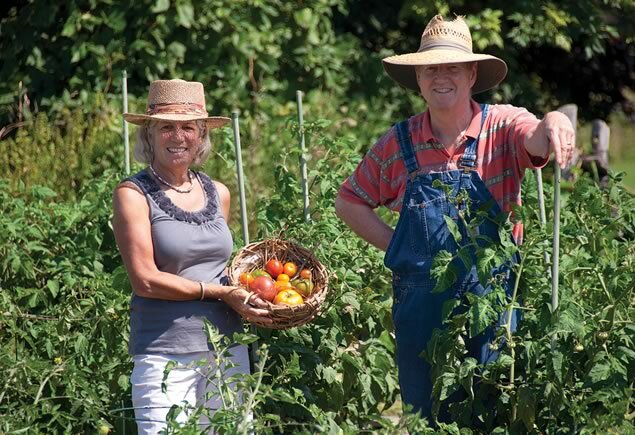 How a couple of avid tomato lovers are helping preserve the amazing variety of their favourite heritage fruit. 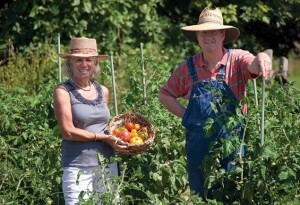 SueAnn Wickwire and Bill Mann in the garden at SueAnn’s Lavender Farm. Photo by MK Lynde. Box Car Willie, Aunt Gertie’s Gold, Arkansas Traveller, Banana Legs, Matt’s Wild Cherry, and the curious Radiator Charlie’s Mortgage Lifter: the names read like entries from the daily racing form at the track. 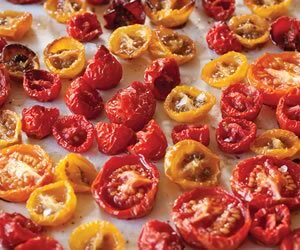 Yet these are just a few of the colourful monikers, rich in story, place and era, belonging to the humble heirloom tomato. 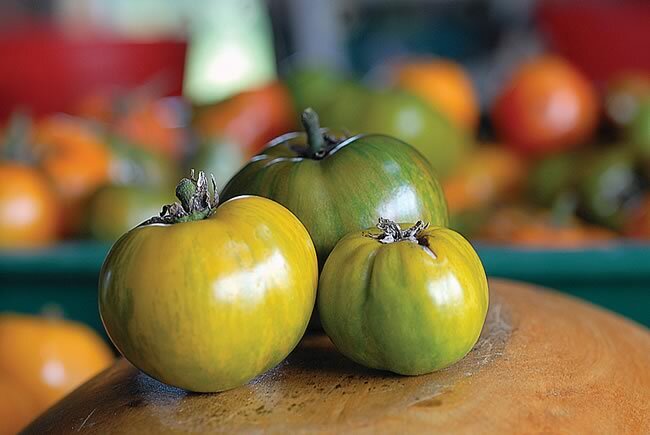 Once an abundant mainstay for the home gardener and market farmer, the heirloom tomato’s future is now in doubt. A potential victim of mass production and monocultured times, varietals of its seeds are currently being preserved against extinction in the curatorial collections of seed banks around the world. 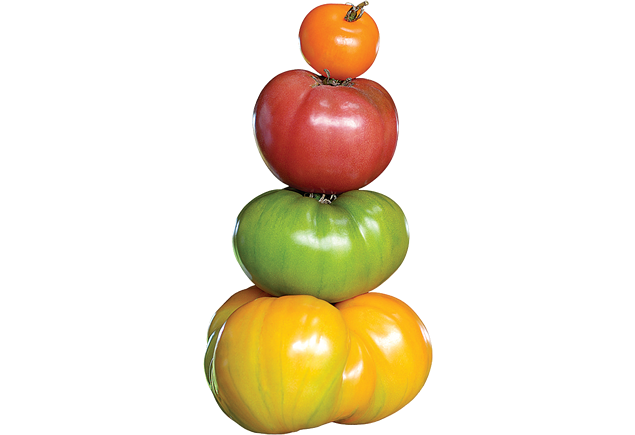 Decades ago commercial growers, wanting to standardize tomatoes for efficiency and profit, created genetically altered hybrids with thicker skins to withstand long distance shipping and extend shelf life, as well as consistent shape and colour for uniform display. Somewhere along the line, flavour fell off the truck. “That’s when I got interested in growing heirloom tomatoes,” he says. 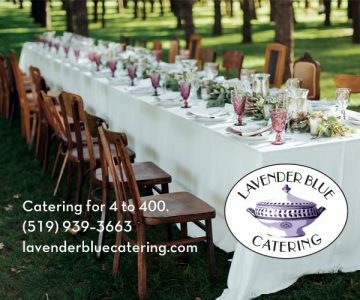 After a few seasons of experimenting with varieties, Bill wanted to share his journey with the world around him, especially his neighbour and consummate gardener SueAnn Wickwire. Together they organized a communal seed ordering scheme so they could introduce friends and neighbours to the joys of growing their own. It was locavore power in action. 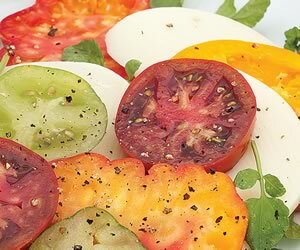 Heirloom Tomatoes with Buffalo Mozzarella This multicoloured salad looks beautiful arranged on a large platter. Photo by Pete Paterson. For more than six years they have been introducing the uninitiated to this wisdom and, not unintentionally, helping conserve and propagate an important part of genetic history. Using their own observations and feedback from members, Bill and SueAnn make up a list of varieties in late fall. Each year, they drop a few and add new ones, trying to keep a nice mix between early and late producers, small and large sizes, and a range of colours. Members choose from the list, and Bill and SueAnn order the seeds from Canadian heritage seed houses. Box Car Willie, Aunt Gertie’s Gold, Arkansas Traveller, Banana Legs, Matt’s Wild Cherry, and the curious Radiator Charlie’s Mortgage Lifter: the names read like entries from the daily racing form at the track. Photo by Nancy Falconer. When the seeds arrive, they pass them on to Katie Dawson, owner of Cut and Dried Flower Farm near Glencairn. In mid March Katie starts the seeds in her temperature-controlled greenhouses under perfect conditions for producing strong and healthy young plants. 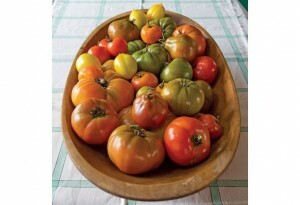 By the end of May, the tomatoes are 12 to 15 inches tall and ready for planting outdoors. Katie, a professional horticulturist, is full of praise for the venture. “Their little project has really grown over the years. 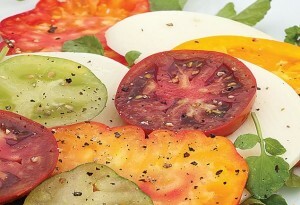 It was Bill who introduced me to heirloom tomatoes. He and SueAnn were way ahead of the wave of popularity for them,” she says. At first, Bill and SueAnn offered their extras to Katie to sell at her nursery. But over time, more of Katie’s other customers began asking for them. As a result, she has begun marketing her own assortment of heritage tomato plants, which she grows on her farm and sells at her nursery. And so Bill’s little seed of an idea is sown again and again. Meanwhile, will people wake up to the immense differences between heirloom and commercial tomatoes? “There’s just no comparison in taste!” says SueAnn with conviction. Photo by Nancy Falconer. 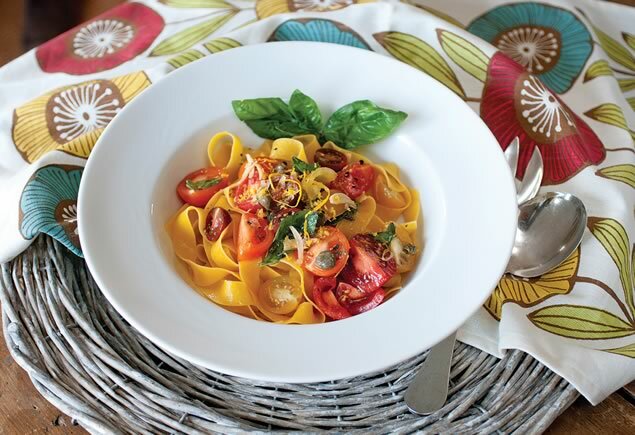 Pappardelle with Marinated Heirloom Tomatoes. Photo by Pete Paterson. 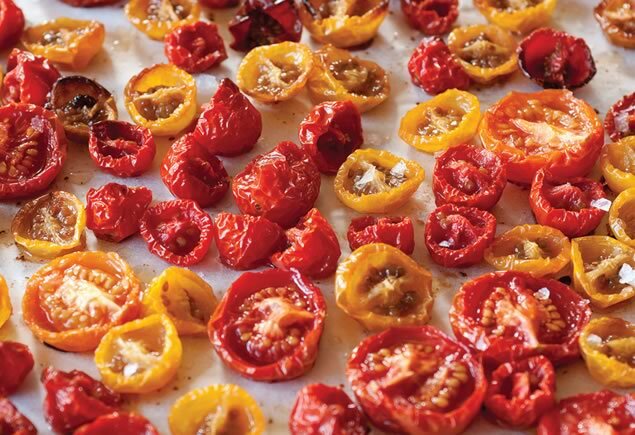 Check out the recipe section and learn how to roast heirloom tomatoes. Photo by Pete Paterson. Be creative. You don’t have to have a garden to grow tomatoes. Many varieties can be grown in blue-box-size containers. Photo by Nancy Falconer. note : If heirloom tomato seedlings are unavailable at your local nursery, try buying the seeds from one of the above sources and ask a grower in your area to grow them for you. It usually takes about six to eight weeks before they’re ready to “harden off” outside. They’re about 12 to 15 inches tall by then. 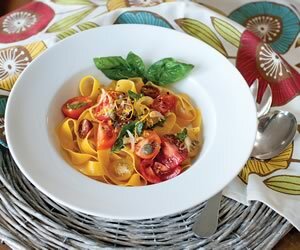 Use the small varieties of heirloom tomatoes for this. They collapse on the trays and the taste is deep, rich and oily after roasting for 2 to 3 hours.